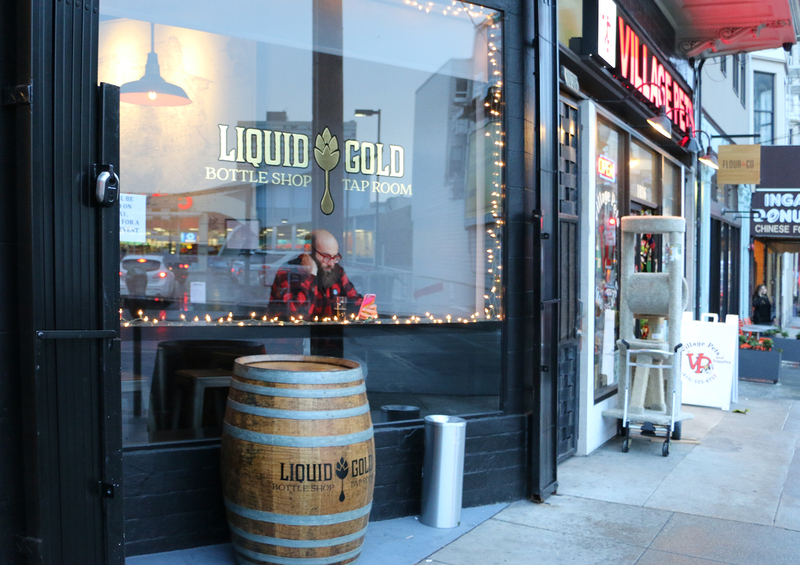 Liquid Gold is a sleek, inviting taproom and bottle shop in Lower Nob Hill. It features 30 taps with a wide variety of mostly California beers. Trying new beers is encouraged and flights are served in taster glasses for those who feel like experimenting. A few wines, ciders and a local mead on tap expand the selection. You’ll find barrel-top tables up front, plus a 35 foot long bar and a large common table back by the bottle cooler. A fine antique map shows the locations of historic breweries in SF before prohibition. A couple of TVs show local sports while music plays. Snacks may be available, and you can order food from nearby restaurants to bring in. Extras: The California Street Cable Car passes a block away, and connects Liquid Gold with the Embarcadero BART station. Liquid Gold is also walking distance from Hopwater Distribution, which serves food, for a two-stop craft bar hop. (or take a bus) Exit Civic Center BART onto UN Plaza. If it is daylight and you are willing to walk through the Tenderloin, go through UN Plaza to Hyde Street, turn right and continue up the hill. After dark, pay attention and walk with your urban-street-smarts turned on in the area between BART and Nob Hill. You may prefer to take a cab or a bus that stops on Market, such as the #19 bus, which stops on 7th Street at the corner of Market. The #19 bus will continue onto Market, then turn right and head up the hill. Get off at Polk and California. Walk up California past Larkin to Hyde, then turn right and find Liquid Gold mid block.